To find the ability of microorganisms to ferment the given Carbohydrate. To determine the ability to degrade amino acids. To determine the ability of microorganism to produce gaseous end products in fermentation. A metabolic process performed by almost all types of bacteria is known as fermentation. This will result in the production of ATP, the ultimate energy source of the organism. This will happen either in the presence or absence of atmospheric oxygen. Bacteria utilize the nutrients in their environment to produce ATP for their biological processes such as growth and reproduction. The enzyme systems in bacteria allow them to oxidize environmental nutrient sources. Bacteria will use different energy sources in the medium depends on the specific enzymes of each bacteria. Many bacteria possess the enzymes system required for the oxidation and utilization of the simple sugar, glucose. 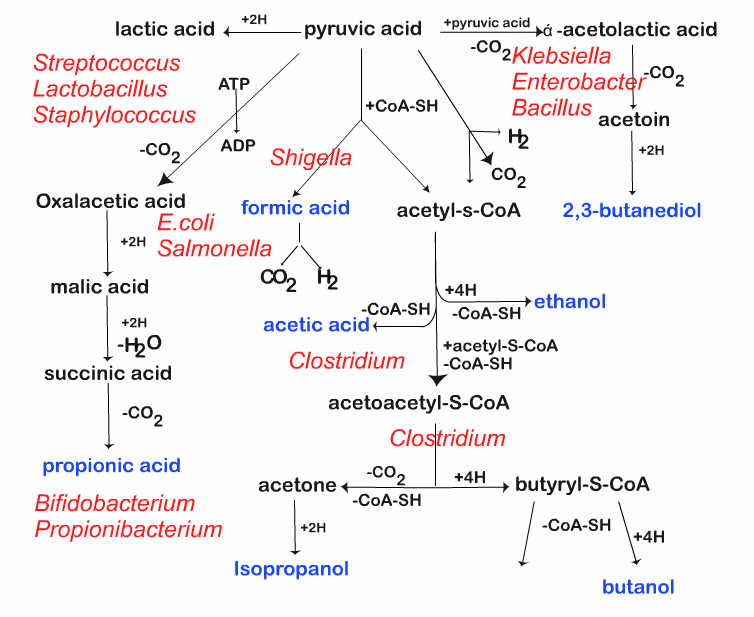 Some bacteria have the ability to degrade complex carbohydrates like lactose, sucrose or even polysaccharides. Such bacterium should possess the enzymes that should cleave the glycosidic bonds between the sugar units and the resulting simple carbohydrate can be transported into the cell. Lactose is a disaccharide consisting of the glucose and galactose connected by glycosidic bond. The bacteria which produce the enzyme lactase will break this bond and thus release free glucose that can be easily utilized by the organism. The characteristics feature of the enzyme production in the bacteria enables them to use diverse carbohydrates and this will aid in the identification of unknown bacteria. Fermentation is best described by the degradation of glucose by Embden- Meyerhof pathway or Glycolytic pathway (Figure 1). The sugar fermentation pattern may be unique to a particular species or strain (Figure 2). Phenol red broth is a general purpose fermentation media comprising of trypticase, sodium chloride, phenol red and a carbohydrate. The trypticase provides amino acids, vitamins, minerals and other nitrogenous substances making it a nutritious medium for a variety of organisms. Sodium chloride helps in maintaining the osmotic balance and provides the essential electrolytes for the transport into the cell while the carbohydrate acts as the energy source. The phenol red is the pH indicator and is initially neutral (pH 7). It supports the growth of most organisms whether they are able to ferment sugar or not. When the bacterium is inoculated into the tube, the bacterium which ferments the sugar will result in the production of acid that will change the color of phenol red. Fermentation reactions often begin with glycolysis. Glucose acts as an electron donor in the fermentation reaction, pyruvate, and metabolic product of glucose act as an electron acceptor. 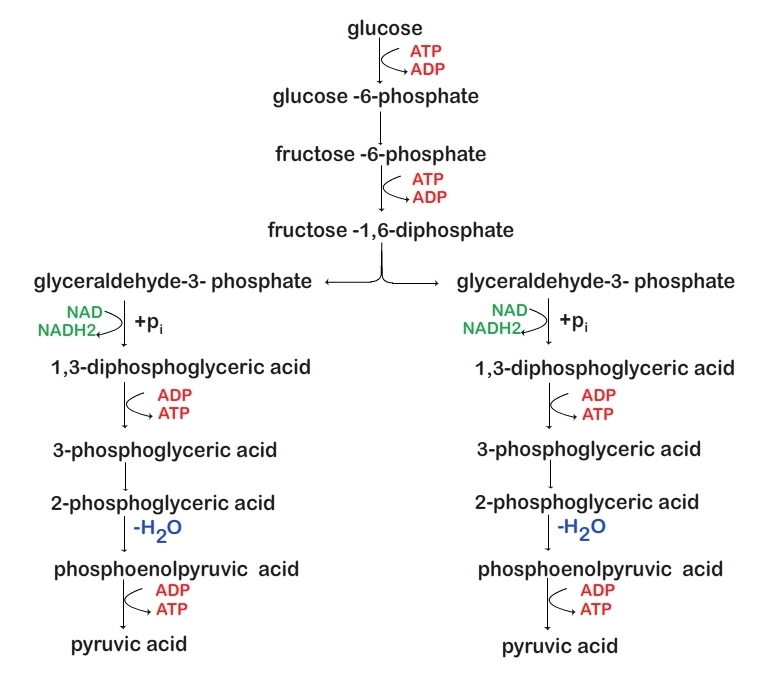 The other disaccharides and polysaccharides are hydrolyzed into glucose or converted into glucose and then the fermentation reaction will occur. Finally the reaction will result in the end products such as acid, ethanol, Hydrogen and Carbon dioxide and other compounds. This depends on the species of bacteria. Phenol red broth is a test is differential for gram negative bacteria. When the organism ferments carbohydrates, acidic organic by products (Lactic acid, formic acid or acetic acid) is accumulated which turns the medium into yellow color with reduction in the pH (acidic). The inverted Durham tubes will detect the presence of gas. The degradation of peptones in the broth may result in the production of alkaline end products, which will change the broth color to pink often at the top of the tube.